SCANA Corporation’s (NYSE:SCG) dividend yield is listed at an enticing 7%, but don’t get suckered in. This utility is dealing with a very troubling situation right now. You are better off sticking to a high-yield stock like utility peer Duke Energy Corporation (NYSE:DUK) and its very generous 4.9% yield. Here’s why. SCANA’s troubles go back to a decision many years ago to build a nuclear power plant from the ground up. Building a new nuclear power plant is an expensive, time consuming, and complicated process. To put it bluntly, building this plant didn’t go well for SCANA. The project was already delayed and over budget when SCANA’s contractor Westinghouse declared bankruptcy. That was the final nail in the coffin of the project, which SCANA shut down before it was complete. The decision didn’t go over well with customers, who were already paying for the project in their monthly electric bills, or regulators. This issue has put material pressure on the utility and its finances, with calls to eliminate the dividend. SCANA took the first step toward that in May, when it announced that the board would be delaying the decision on the second-quarter dividend. At this point, it’s safest to consider the dividend gone, despite the fact that quote services still list the yield at 7%. The saving grace here is that Dominion Energyhas offered to acquire SCANA. But a decision on that transaction likely won’t be made by all of the key parties until the end of the year at the earliest. Dominion has also said it will walk away from the deal if regulators ask for material changes to its offer. Even if the transaction goes through, SCANA shareholders will see a nearly 10% cut in the dollar value of the dividends they receive based on the deal mechanics.Dividend investors, specifically, should be very wary of SCANA. A better option for investors looking for a dividend-paying utility would be Duke Energy. It’s a pretty boring company, providing electricity and natural gas to around 9 million customers (combined), operating midstream natural gas assets, and running a growing renewable energy merchant power business. The yield is a generous 4.9%, which is more than double what you can get from an S&P 500 index fund. That dividend, meanwhile, has been increased for 13 consecutive years. Over the past decade, the dividend has grown at around 3% or so annually, roughly in line with the historical rate of inflation growth. However, the utility is targeting 4% to 6% earnings and dividend growth each year through at least 2022. 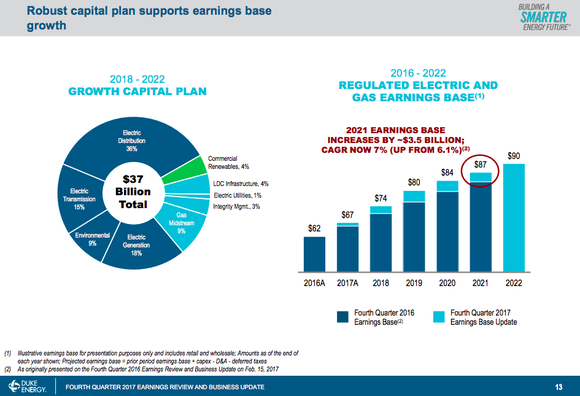 Duke Energy’s spending plans will support its earnings and dividend growth. Image source: Duke Energy Corporation. Backing that growth is roughly $37 billion in capital spending between 2018 and 2022. But, unlike SCANA, Duke’s big projects have been running relatively smoothly lately. For example, the utility recently completed the W.S. 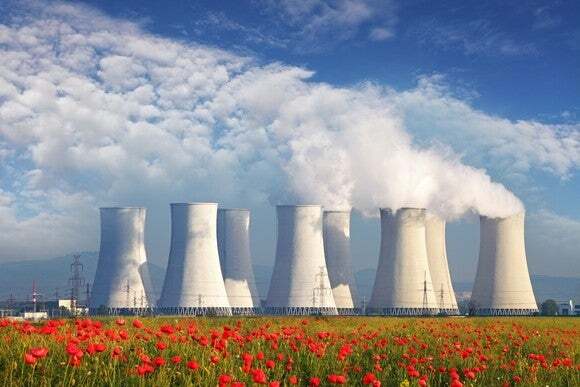 Lee natural gas-fired power plant without any material problems. And another gas-powered plant that’s expected to come on line in Florida later this year is solidly on track. Its other major investments are a mix of natural gas pipelines, upgrading its infrastructure, and renewable power. There’s nothing in this mix that suggests Duke is going the way of SCANA anytime soon. To be fair, Duke did run into some troubles building a clean-coal plant in Indiana (delays and cost overruns). However, that project was completed in 2013 and none of Duke’s current investments are nearly as ambitious. It should be much smoother sailing from here. And that means a solid dividend backed by a growing utility. Duke won’t excite you, but that’s the point: It will simply keep rewarding you with a generous dividend. 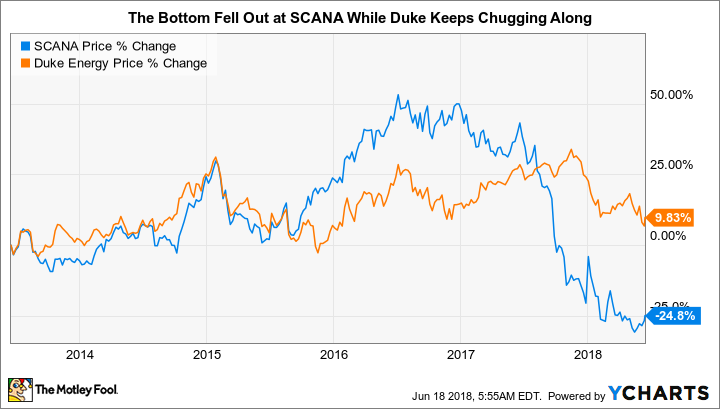 Dividend investors should be extremely wary of SCANA. There’s just too much risk involved, with the best-case scenario being a takeover that results in a nearly 10% dividend cut. Duke — and its 4.9% yield — is much less exciting, with generous earnings and dividend growth (for a utility) backed by a solid investment plan. Moreover, Duke has been executing well lately on its construction plans (unlike SCANA). It’s the better risk/reward play here for most income investors. This entry was posted in Best Stocks on July 11, 2018 by admin.